the scent of green bananas: happy (c)hanukkah! Posted by santos. This entry was posted on 20071205 at 9:18 PM You can skip to the end and leave a response. your next step is to feed the cheesy goodness to an evil dictator, wait for him to fall into a cheese-induced coma, then cut his head off. you know for ages I've avoided cheesecake (something about cheese in dessert), but I've started having a change of heart. That looks wonderful! 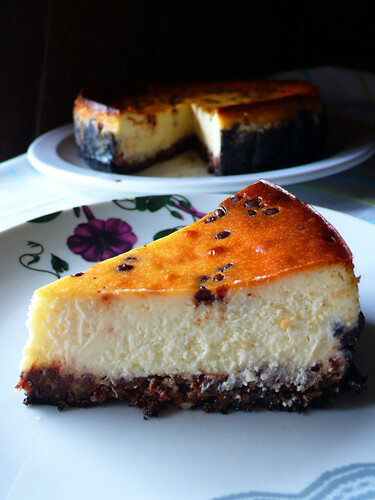 I love cheesecakes.. ;) your look so yummy..!! cathy, i've avoided cheesecake too, but this one was really good. i inadvertently added too much cream to the recipe (double the amount, eek), so i don't know how much it changed the recipe, besides having all the choco chips sink to the bottom. it might have made it lighter in texture than it should be, but it's great like that. mamabok, oh i wish you could taste this one--sooo good! Oh wow, this looks amazing...I'm stunned!